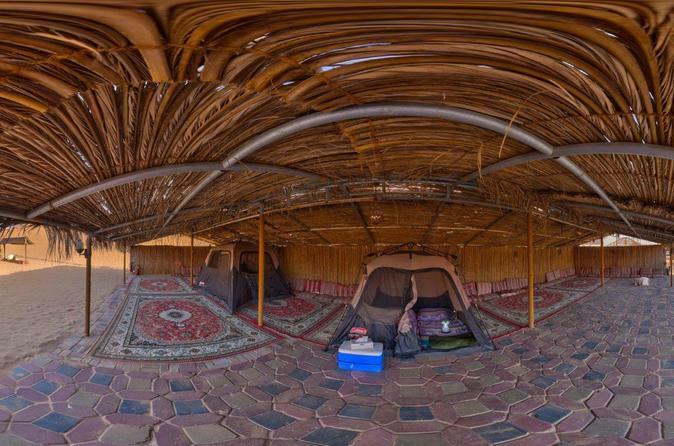 Sleep under the stars and enjoy fun desert pursuits and dinner on an overnight experience from Dubai. Ride a 4x4 Land Cruiser into the desert, enjoy a 40-minute dune bash, and take photos of the sunset before retiring to a Bedouin-style camp. Enjoy a complimentary camel ride, join in optional sports like sand boarding and quad bike riding (additional cost), and sit down to a lavish dinner and live entertainment. Later, spend a moonlit night in a cozy, traditional tent before a delicious breakfast and return trip the next morning.